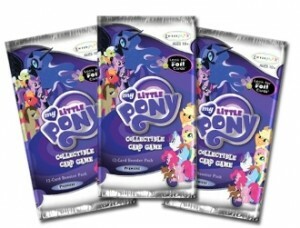 Another new entry in the cute and sparkly card game genre this week is EnterPLAY’s My Little Pony CCG. The Premier set consists of 250 cards, made up of mane characters, events, resources, friends, troublemakers, and problems. The game is played head-to-head with each player assigning mane characters and friends to confront problems. Confronting a problem scores a point but both players’ problems must be confronted before new ones can be drawn. My Little Pony CCG is available in Two-Player Starter Sets, Theme Decks, and 12-card Booster Packs.